Wheaton Terrier? I knew a wheaton, his name was Billy. 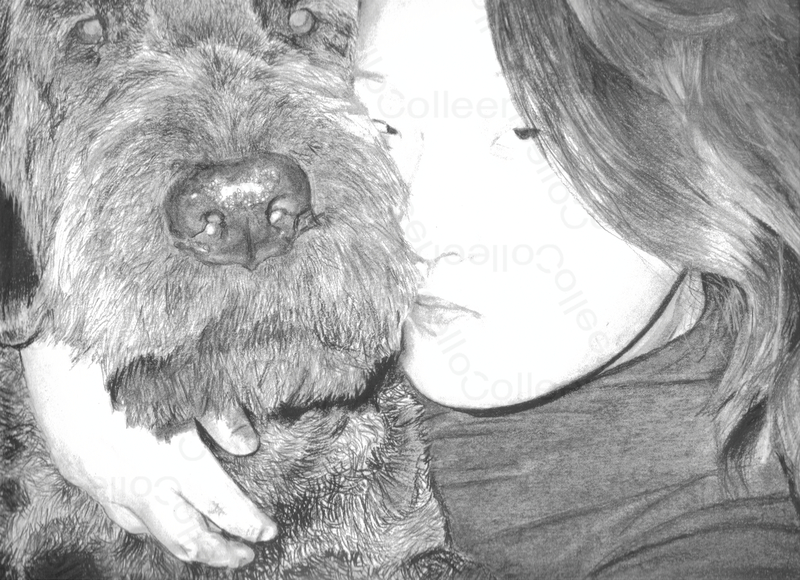 Hi Colleen, You really capture your subject’s spirit. How do you choose your subject matter? You’ve got quite a range. Hi Colleen, Really really nice work!! Thanks for following me and now I am following you. this is so amazing it looks just like a photo! your work is beautiful, just beautiful!!! Wow! My sister-in-law is a phenomenal artist and I don’t think she could have done that well. Bravo! Wow, you’re really good. Is that graphite on smooth drawing paper? I wasn’t ever very good drawing with pencil, but oddly, I was really good with a ball-point ink pen. You’d think it would be about the same since it is both hand drawing with a hand-writing implement. The shading wasn’t what I was bad at either when it came to the graphite, my lines would all be off. I can’t draw any more though, visual art like this for me is limited to paintings (they’re the only things I can do now, what with the beginnings of tardive dyskinesia). Amazing work!!!! I love to draw, but due to multiple factors (aka children), I haven’t been able to draw in ages… By the way, thanks for subscribing to my blog! Thank you for the great compliment!! I was also going to ask if it was a photo – the detail is amazing. Again, beautiful work. thanks for following me on Accidental Happiness; i’m glad it led me to you and your work! Your drawings are just amazing! Not many people can draw such accurate and detailed pictures like these. You have some real skill. Thanks so much for subscribing to my blog by the way. ^^ I think you’ve earned a new fan too. Wow, that is some truly amazing detail. You’ve got some real talent! Wow! I love the amount of detail in this drawing. And the way that you were able to capture light by having a specular off Jim’s nose and the highlighting on Sarah’s hair. Well done! Wow. WOW! Did I say “wow”? This is GORGEOUS! Beautiful drawing! Thank you for subscribing to my blog ~ It lead me to yours! Lovely work. A wonderful sense of our four-footed companions – as well as the two-footers. You are very gifted! Will be coming back to enjoy your talent! I’m looking forward to following you and really like your philosophy – leave things better than you found them! Awesome pics — I too love our dogs they have brought so much into my family’s life. btw thanks for coming to my little blog space. I’ll definitely be checking you out! This is really nice. With the way you’ve used the charcoal, it looks as though you’ve used a variety of sizes and even kinds of charcoal—very cool! Thanks for the ‘like’! and for sharing your wonderful work! Nice work … love the sense of realism related to photography that you exemplify in your technique. There is a stark realism to these images that makes you relate to the subjects immediately. Well done. Hey! Thanks for subscribing! 🙂 Wow, your drawings are incredible. I´m always amazed by people with great artistic skills, it is such a gift. I saw that you subscribed (thanks!) and wanted to visit your blog, too. I am always amazed by artists, especially since I can’t even draw a stick figure. You are indeed a talented one. I looked at all three pictures on this page, and was mesmerized. Absolutely beautiful work! Beautiful drawing — thanks so much for subscribing to my blog … i love discovering yours!! At first glance, I admit I was another doofus that thought this was a photograph, but then, the longer I looked at it — your work is mesmerizing — I realized it’s a rather amazing drawing. Your talent is impressive. Thanks for visiting and subscribing to my site so I could return the compliment to yours. Oh stop, you’re not a doofus. Its different seeing them on the computer than in person. I am glad that people do think they are photos haha, because i still see things i wish i could change. oh well, i guess thats why we say we are our own worst critic. Hi there, thanks for subscribing to me – i’m now subscribing to you! This drawing is stunning! Thank you for the subscription and the compliment! Your work is exquisite. Hair and fur are so difficult to master and you’ve done both really well. Thanks! Hair is pretty hard, I do like drawing fur, weird maybe? Maybe I find it relaxing/meditative because you have to really concentrate on the direction it is going. I love how you’ve captured the wetness of his nose… so perfect. Thank you so much for stopping by and noticing the detail!!! hey, thanks for following me. thanks for following and hope to see you around! I was thoroughly enjoying your artwork when I thought they were photos, but I was blown away when I finally caught on that they are drawings. This one is my favorite. Bravo! Lucky Sarah. Lucky Jim. To fall within your line of sight and have their beautiful souls rendered for eternity to witness. How can anybody come out this — anything but better than before. Although maybe Jim is oblivious to it, but I’ll bet he’s better for it as well. Thank you for sharing your work with the rest of us!! I am pretty sure you made me blush! Thank you for taking your time to look around my blog and comment. That is probably one of the nicest things someone has said. I would love my work to saty around for “eternity.” Who knows, maybe it will end up in a gallery or museum! With enough support from subscribers like you I feel like I can move mountains! Your work is amazing! True beauty! I had to look really hard to see this wasn’t a manipulated photo. Amazing, realistic detail, lighting, and highlights. You really have a gift. what a gift you have! Oh, to be able to capture life as you do. Your work has emotion. Thank you for following me and I am thankful I can now follow you and enjoy your art. great job with the hair! Wow!!! All of what I’ve seen on your blog is amazing, but this one really stood out. The dog almost appears to be in 3D, like standing out on top of the picture! You are so gifted!!!!! Keep it up! I love it! Wow, I honestly thought this was a photo. Words fail me…. amazing. Love this! Dogs = love. Yes dogs dogs do = love, no doubt! at first glance i thought this was a photo! really amazing detail! The drawings are intense and passionate, I embrace those that can take what there heart and soul feel and bring it out for all to see. Continue to dance upon your canvass. Great picture, I really like the dog, his fur is really nicely done. Thanks for subscribing to my blog, glad I found your art! Lovely drawings – animals can evoke so much emotion, can’t they? Perfect subjects! Thank you for noticing the detail! Wonderful, inspiring work, Colleen! I look forward to seeing more, thank you for sharing! You have an incredible talent. Your work is brilliant! Wow!! Stunning pictures. Really inspiring! Your attention to detail and texture is impeccable! Wow! The dog is so adorable but what caught my attention is the woman’s eye. Soulful to piercing. Like she can look through me. Not that I have something to hide. Your talent is just amazing. Thank you for sharing your work with the blogging world. Look at that sweet puppy face! Wonderful! Simply lovely. Keep up the good work. You really have a talent… it’s beautiful! Just awesome – really beautiful. Very cute! I’d like to see more detail in the face, though. There’s an awful lot of flat white. Other than that it looks awesome! My scanner doesn’t do this drawing justice. WOW! I couldn’t actually believe i wasn’t looking at a B&W photo, except yours is better! you capture such an exchange of energy, both to each other and the viewer… Amazing. Incredible talent. Wow! It almost looks like a photo. I love how you handled the lighting aspect, great work! Are you really self-taught? This piece is so alive! You truly have a gift. Thanks for sharing it. I originally thought this was a photograph; I mean that in the best way. You are very talented. Very impressive drawings. I, too, thought they were photos at first glance. looooovely! I’ve nominated you for the versatile blogger award – check it out! Amazing work. I would swear this is photo that has been altered to look like pencil. When I was young I was always getting pencil sets, art sets, paints etc. Yet, I had very little ability to draw with any reality; and that is when photography grabbed me. You are quite skilled and I look forward to more. nice, at a glance it looks like a japanese face mask.